Own a Web Site for 350 Dollars per year, plus cost of paying for domain, about 12-15 on GoDaddy.com. 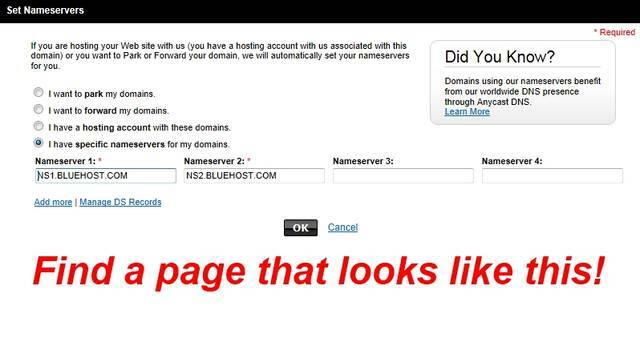 - How to point your DNS at HoboTraveler.com hosting? Note: You may want to have a free one hour consultation on what Domain Name or names to buy, before you buy a domain name. 1. The Easy Way: The cost of hosting is cheap, what you are paying 350 U.S. dollars for per year is professional help in getting started, SEO, until you learn to earn. Log into your domain company, then and look for a page like this, they will use words like DNS or Namservers, or point your domain, etc. Sometimes, the ones like GoDaddy.com, you can call, we recommend GoDaddy.com, do not buy price! The first company we used, went out of business, what a nightmare, the cheap one are just resellers, and the go out of business, they are dangerous to use. What is DNS or Domain Name Servers? Read on Wiki. Simpler Definition of DNS: It is asking the company where you bought your domain, to point the name towards a hosting company. This is normally automated, you log in, and find the words nameserver, or DNS, and say, you have hosting. 2: Easier Way: Get a techie friend you know to help you, there is almost always somebody you know, somebody you trust to help. 3. Easiest Way: We can call you on the telephone, and walk you through moving it, but in reality, number two is easier for you.